Ibrox Noise: Is this the real reason why Killie boss snapped at Stevie? Is this the real reason why Killie boss snapped at Stevie? 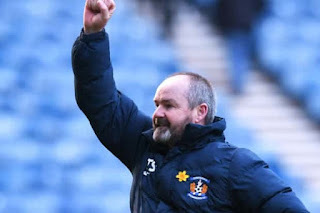 As we mentioned earlier, the meltdown between Steve Clarke and Steven Gerrard all began when the Killie boss endeavoured to get Jermain Defoe banned. It was poor. But just what led the Killie boss to have such a tasteless meltdown and to conduct himself in such a poor manner publicly? Well, only four weeks ago Kilmarnock were stunningly on top of the league, and starting to be spoken of like a ‘Leicester’, even including by your friends on Ibrox Noise. It wasn’t inconceivable back then to some followers that they might be a serious dark horse to contend for the title. But inevitably, as it did for Hearts months ago, it went into freefall. Following their win against Rangers on the 23rd of January, Killie have played three won none, and only picked up two points in the process. From first they’ve plunged to fourth including falling a clear five points behind Rangers and while we may be way off base, we can’t help but wonder if this collapse contributed towards Clarke’s ire. It even included a fightback at Dundee, one of the bottom teams, to give some idea of the form Killie are now in. Could Clarke have thrown his metaphorical rattle out of the pram over bad form and used Steven Gerrard’s Rangers as his target? We know the guy is Celtic-minded, and many have spoken of him as a future boss at Parkhead, so his using Rangers as a cathartic pot shot may well not be totally a million miles from the truth. Whatever the reason though, it was out of order, and his continued defence of it reeks of a stubborn old man in the wrong and refusing to listen to reason or accept his own mistakes. I do believe Killie were harshly treated by the 2 game ban. But 2 wrongs don’t make a right. Clarke behaved badly. Scottish authorities are incompetent at best with all clubs, bar Celtic, receiving harsh decisions. No need for managers to encourage more. Jones dived to win 3 points and their only punishment was a 2 game ban.I`m sure they think it was well worth it.I notice Clarke doesn`t mention how this cheating cost Neil McCann his job.